Uplands is a pretty area with mature landscaping and forest tucked away behind Country Club Centre and Long Lake. This is a really nice, middle- and upper-middle-class area, with neighbourhoods developed during the 1970's-90's. The area is maturing nicely, having already protected the local Linley Valley nature area, and with popular ocean parks less than 10 minutes' drive away. Properties in Uplands often perch on rocky hillsides, or they occupy the cool dark spaces at the bottoms of small ravines. It's an exciting area for looking at homes, because there is much variety. 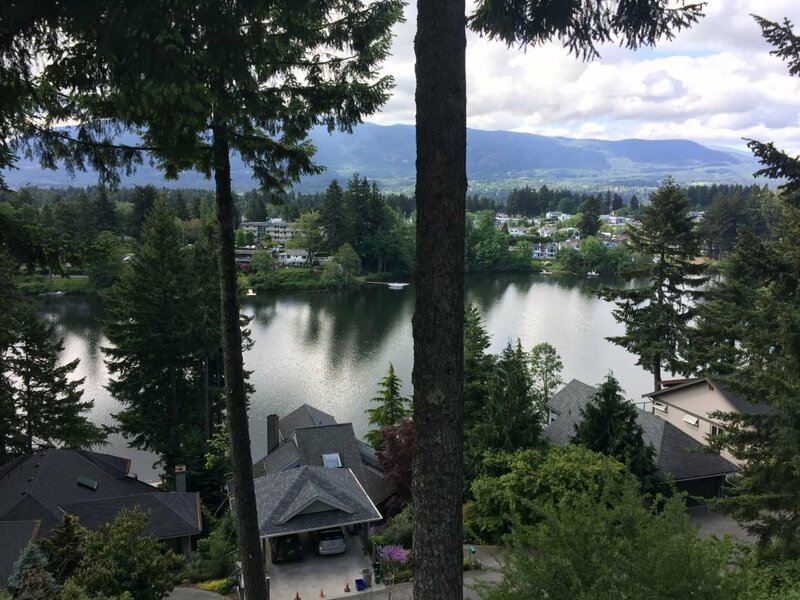 The uneven topography makes for some large lot sizes, and many of the homes in Uplands are Nanaimo's best view homes, overlooking Long Lake, Mount Benson, or even the ocean. Need help buying or selling in Uplands? Contact me. Some of the most highly-sought-after homes in Nanaimo are the bare-land strata properties of Long Lake Heights, overlooking the lake between Rutherford Road and the Country Club area. The homes seen below are in this neighbourhood. View Long Lake Heights homes for sale.